Under Zviad Gamsakhurdia, the first democratically elected president of the newly independent Georgia, the nation continued to function under the 1978 constitution of the Georgian Soviet Socialist Republic, which was based on the 1977 constitution of the Soviet Union. The first post-communist parliament amended that document extensively. 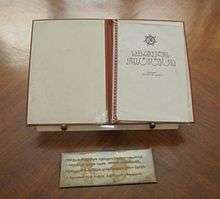 In February 1992, the Georgian National Congress (the alternate parliament elected in 1990) formally designated the Georgian constitution of 21 February 1921 as the effective constitution of Georgia. That declaration received legitimacy from the signatures of Jaba Ioseliani and Tengiz Kitovani, at that time two of the three members of the governing Military Council. In February 1993, Eduard Shevardnadze called for extensive revisions of the 1921 constitution. Characterizing large sections of that document as wholly unacceptable, Shevardnadze proposed forming a constitutional commission to draft a new version by December 1993. On 4 January, Mikhail Saakashvili won the Georgian presidential election, 2004 with an overwhelming majority of 96 percent of the votes cast. Constitutional amendments were rushed through Parliament in February strengthening the powers of the president to dismiss parliament and creating the post of prime minister. Zurab Zhvania was appointed prime minister and Nino Burjanadze, the interim president, became speaker of parliament. On 15 October 2010, the Parliament of Georgia adopted with 112 votes to five major amendments to the constitution, which will significantly reduce powers of the next president in favor of the prime minister and the government. The new constitution will go into force upon the 17 November 2013 inauguration of Giorgi Margvelashvili, the winner of the 2013 presidential election. "Constitution of Georgia (2010 amendments)" (PDF). Parliament of Georgia. 24 August 1995. Retrieved 1 February 2015. 1 2 3 4 5 6 Darrell Slider. "The Constitution". Georgia: A country study (Glenn E. Curtis, ed.). Library of Congress Federal Research Division (March 1994). This article incorporates text from this source, which is in the public domain. ↑ Walker, Shaun (28 October 2013). "Georgia elects oligarch PM Bidzina Ivanishvili's candidate as president". The Guardian. Retrieved 28 October 2013.